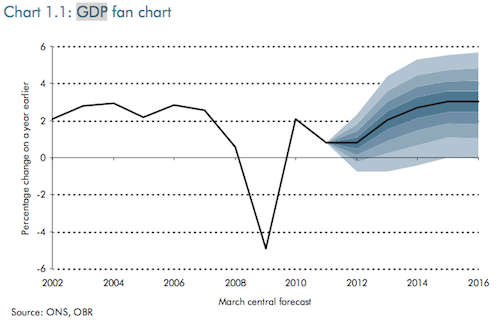 The GDP figures: are economists failing the Chancellor? 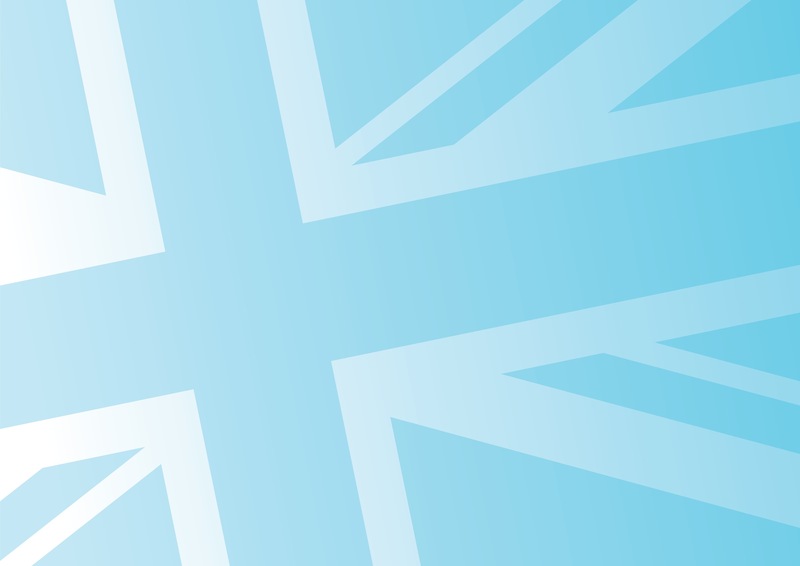 Today’s GDP figures have made the news through being significantly worse than forecast: there was a 0.7% fall in output compared to expectations of 0.2%. Now it’s true that the ONS data is provided quarterly and the OBR forecast is given on an annual basis but the divergence between what was forecast and the actual data would be a joke if British public policy was not based on it. 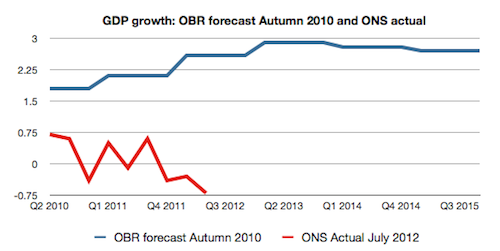 I’m sure we’d all like to share the OBR’s continued optimism, but the trends of the two series diverge. I would say gently to my hon. Friend that only a few years ago the banking crisis was not foreseen, and the same people who did not foresee that are still giving us advice. We are probably in far worse trouble than is generally accepted. I’m optimistic about humanity’s potential to make progress but, as I have said, I think economists and politicians have taken us down the wrong path. If in a year’s time the OBR is still failing to predict even the general pattern of events, I hope the profession of economists will examine why their theories are failing the Chancellor and society so badly. In the meantime, I recommend The Cobden Centre, its primer and its recommended literature. As in all professions there are a lot of people that barely make the grade, and promotion and talent are seldom well correlated. At the same time we live in a culture that pays attention to people on the basis of who they are rather than what they say. Result, a lot of mediocre talent in positions of authority leading the debate and setting the agenda. 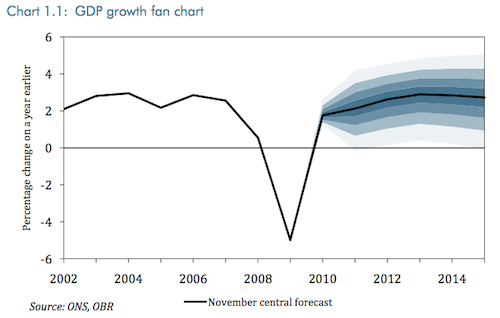 For what it’s worth, last November I forecast 2012 GDP year on year growth at minus 0.7%. At the time, the consensus of the “professionals” was for growth of about 1.5 to 2% But no one notices people like me, and those that did thought me overly pessimistic. Journalists and politicians pay a great deal of attention to forecasts without ever asking how accurate they have been in the past. Forget GDP. What’s more important is an accurate figure (or at least ball park) for government debt. Not just the borrowing, but all the debts. Pensions included. The problem is that the numpties think that more and more government spending is the solution because they have been feed horse manure on the size of government fraud in their accounts. Reveal the true figures, before its too late. Delay, and you will be blamed. 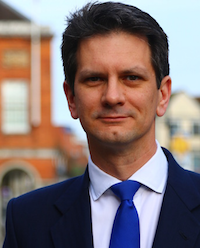 Delay, and the public who rely on government for pensions get shafted. Keeping quite means you are the problem. Now if you reveal the mess, think about the reaction. You will get a small state, because the vast majority will insist on it.